Donald Trump: Vladimir Putin's praise is "a good thing"
CEDAR RAPIDS, Iowa -- One of Donald Trump's rivals for the Republican presidential nomination has called Russian President Vladimir Putin "a gangster." Another called him "a bully." The 2012 Republican nominee, Mitt Romney, once called him "a real threat to the stability and peace of the world." However, Trump's warm words for Putin -- which has become a source of ire for some Republicans -- continued at a rally in Cedar Rapids, Iowa, Saturday. "I mean you look, we're all tough guys, but wouldn't it be nice if like Russia and us could knock out an enemy together?" Trump said. "Russia has plenty of problems, but I'll tell you what, if Putin likes me, and he thinks I'm a good, smart person, which, I mean I hope he believes it," Trump added. "I mean I am brilliant actually ... If he says something positive, that's a good thing, that's not a bad thing." Earlier this week, Putin said that Trump was "bright and talented." Trump called the compliment "a great honor." In an interview with MSNBC on Friday, when pressed about accusations that Putin uses brutal tactics - including killing journalists and political opponents, Trump said, "I think our country does plenty of killing also." Later on Friday, Trump gave an interview to WABC and wouldn't back away from his comments. "We're killing people. They're killing people," Trump said. "Everybody and you know, it'd be nice to have peace in the world. So, Putin said some very nice things about me, he doesn't know me, but he certainly gave me great complements the other day, and all I did was respond with a thank you, that's very nice." In Cedar Rapids, reaction to Trump's chumminess to Putin was mixed. Terry Ecklund, a 64-year-old farmer and substitute teacher, didn't think Trump was serious. "I think Trump's just being himself," Ecklund said. "Nobody can trust Putin, no matter what. I think he's just saying that - just part of him being who he is. I don't know if he could mean it that much because Putin - I wouldn't trust him for anything." Scott Erdman, 56, an engineer for a military contractor in Cedar Rapids, agreed. "I think it's all part of the show, you know?" Erdman said. Trump's rally on Saturday was full of Christmas spirit - which Trump has said repeatedly on the trail there isn't enough of. 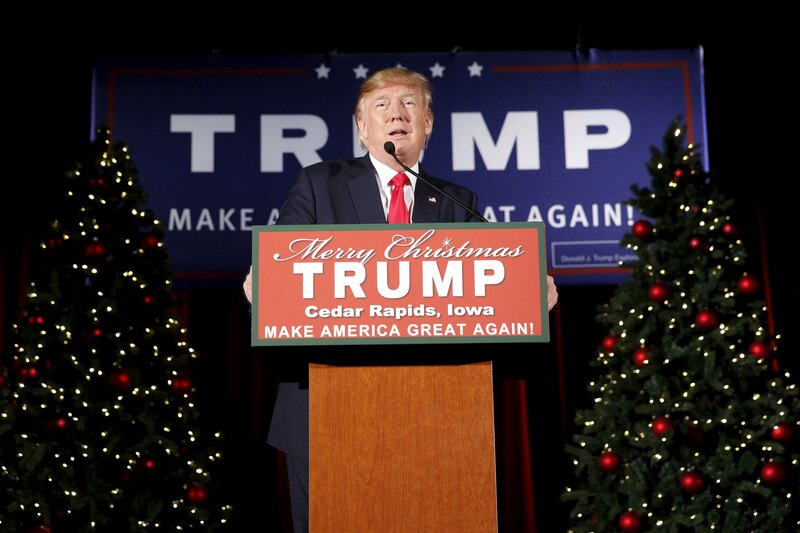 In September, Trump said, "Remember the expression 'Merry Christmas?' You don't see it anymore ... You're going to see it if I get elected, I can tell you right now." The Cedar Rapids stage featured Christmas trees, and the hall at the Veterans Memorial Building was decorated with Christmas lights. A Christmas soundtrack played over the loudspeaker. Trump took the stage to "Deck The Halls" by Mannheim Steamroller instead of his usual "We're Not Gonna Take It" by Twisted Sister. With another Democratic debate pending Saturday night, Trump made sure, as he was wrapping up, to mention the controversy that has stirred up Democrats regarding allegations that Vermont Sen. Bernie Sanders's campaign improperly accessed proprietary voter data belonging to the Democratic front-runner, former Secretary of State Hillary Clinton. Trump, however, laid the blame at Clinton's feet. "By the way, did you see what Hillary did to him?" Trump said. "I told you, she's like a snake with no energy." Trump is expected to head to Grand Rapids, Michigan, on Monday for his second trip to the state since announcing his candidacy.